We give talks in schools, colleges and other locations, focusing on emotional health and coping with the issues with which young people sometimes struggle. Samaritans are also available to talk to other groups of any age, explaining what we do and why. Arrangements can be made for wheelchair users and those with mobility problems to be seen nearby. Please phone us for details. We're here for everyone, whatever your problems may be. Our Tunbridge Wells volunteers are trained to be good listeners, to be sensitive to callers' distress and to explore feelings, including those which may lead to suicidal thoughts. We do not tell you what to do, but by listening and talking through your feelings, we hope we will be able to help you get through difficult times. You don't need to be experiencing suicidal feelings to contact us; however if you are, you can be sure of an understanding and non-judgmental listening ear. We won't judge you or tell you what to do and you can talk to us for as long as you need to, in complete confidence. We believe that it's important to be able to talk about difficult feelings and that being listened to, and accepted without prejudice, helps alleviate feelings of distress and despair that can sometimes be overwhelming without support. We make no charge for our service. All our volunteers are fully trained and we aim to be friendly, welcoming and there, just for you, whether you're local, from further afield or just visiting Tunbridge Wells. Find more information on schools and outreach programmes in Tunbridge Wells. Tunbridge Wells & District Samaritans, a charity registered in England & Wales (1168382). 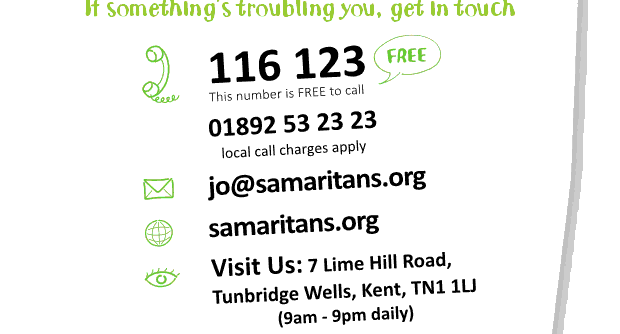 Tunbridge Wells & District Samaritans is a recognised branch of Samaritans.